Seagulls are a familiar sight in every coastal resort. Anyone buying a property in a seaside resort must expect to have all the associated aspects of coastal life. The sea breezes, the sandy soil, the fact it doesn't snow very much at Christmas due to the salt air and of course the wildlife. As someone brought up by the seaside on the North West coast of England, UK, I adore the sound of seagulls. There is something about their wild cry, even at 6am, which I find uplifting. As a child, I would lie in bed, waiting until it was time to get up for school, listening to the gulls and the dawn chorus. Sometimes, it sounded quite eerie, but it was a sound I loved. Never did I feel the birds were a problem, nor a nuisance. I never felt threatened by them and our garden was a richer place for their presence. 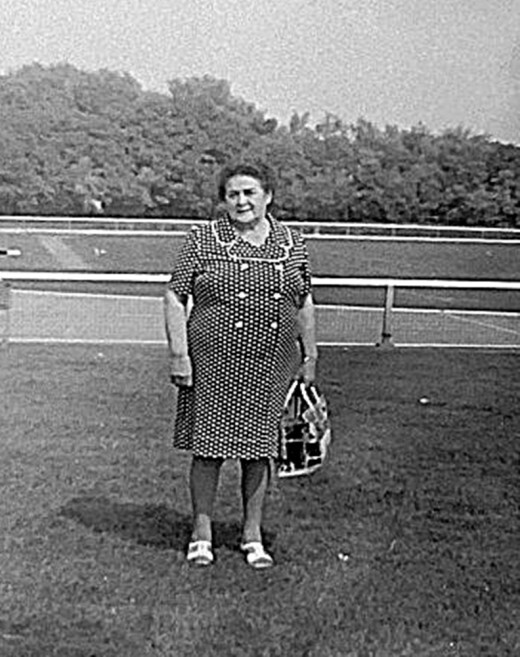 My late grandma, for whom feeding the birds was a great pleasure in her old age. 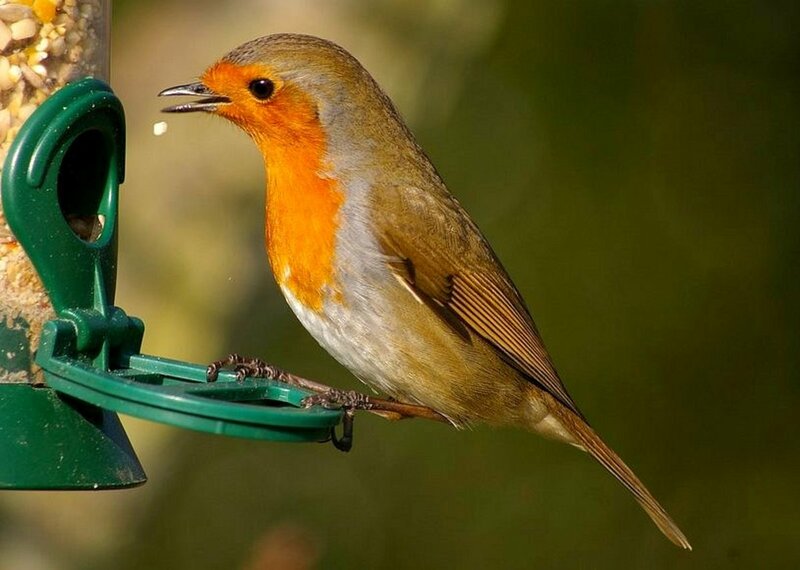 We always put out food for the birds and my late grandma took great pleasure from watching them in the garden. Her bedroom overlooked the shed roof and we would put out bread for the smaller birds and then bacon rind, which the sparrows and starlings tried to eat quickly before the seagulls came along. In winter, often very hungry, the gulls would devour it in seconds. Grandma and I would also go down to the seafront, taking a bag of stale bread to feed the pigeons and gulls. It was a great achievement if we could persuade one to sit next to me, or even perch on my hand, to feed. I never felt any fear. I just enjoyed watching them. The swirl of wings and cries as they swooped around in delight was exhilarating and made me feel at one with nature. 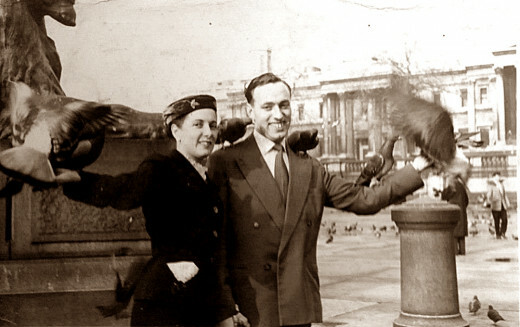 My own mother and father feeding the birds inTrafalgar Square, London, on their honeymoon in the 1960s. About four miles down the coast was a fishing port and there were even more gulls there, following the trawlers and hovering low over the docks, waiting for their spoils. They had done so for generations and to the best of my knowledge had never been a danger to anyone. However, in recent years, I have noticed a distinct movement against the gulls. 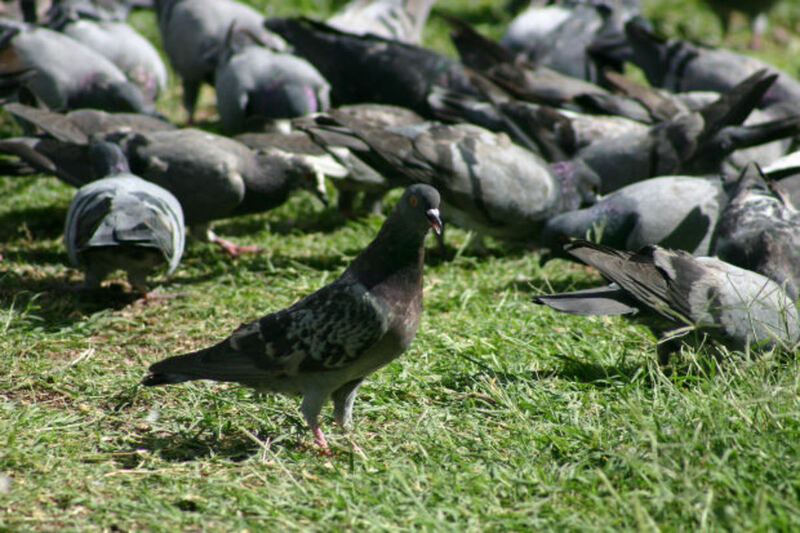 I first became aware of this about five years ago, coincidentally when the local council took to poisoning the pigeons I had fed as a child, deciding they were suddenly a public nuisance and "flying vermin" which must be "culled". If they had tried telling that to my grandma, she would have been distraught. They had brought her such pleasure in later life. She called them "my birds" when they were in our garden and kept a permanent lookout for predatory cats. The gulls, however, appeared to be even more disliked than the pigeons, whose faeces was said to spoil public buildings. 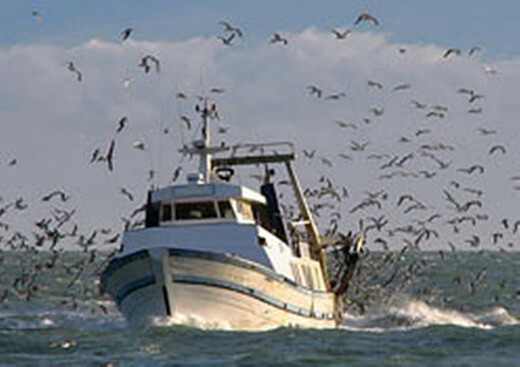 A familiar sight in a coastal town: Seagulls swooping around a fishing vessel. All of a sudden, a great tide of public feeling went against the gulls, who were behaving only as they had done for generations, following their instincts in bringing up their young and finding food. Local residents complained about seagulls defecating on their cars. Residents complain of seagull "crisis"
I recall the first time I became aware of the seagull issue was when I read how a postman was pursued and "dive-bombed" by a gull on his round every morning. The bird, protecting its young as they roosted on a chimneystack, didn't actually peck him, but merely tried to warn him off. Luckily, this particular postman took it in good humour and became a bit of a local celebrity, featured in the newspapers and on regional television. However, once he had "gone public" with his tale, other people who were less amicable toward seagulls seemed to come out of the woodwork and suddenly, it was a crisis situation, they claimed. People who surely must have lived side-by-side with gulls for years suddenly claimed the birds were ruining their lives. There were complaints about the birds defecating on cars and on clean washing on the line. Others complained the gulls' cries were waking them up too early in the morning. One woman said she couldn't eat a sandwich in her garden because gulls swooped around, apparently trying to steal it, while a grandma said her three-year-old grand-daughter found it frightening when the birds flew too close to her pram when she was eating. A dog-owner said she was scared to go outdoors with her pet because he was small and she feared a seagull would carry him off. Looking at these complaints, I felt they all seemed quite minor and some only speculative and rather foolish. I cannot remember ever reading about a gull carrying off a dog in my hometown. The birds employed the "swooping" behavior only in the spring, when protecting their young. They had not actually pecked or otherwise injured anyone. The simple solution would have been not to eat outdoors until the young birds had flown the nest. It was only a matter of weeks. Surely it would not greatly inconvenience anyone to eat indoors? 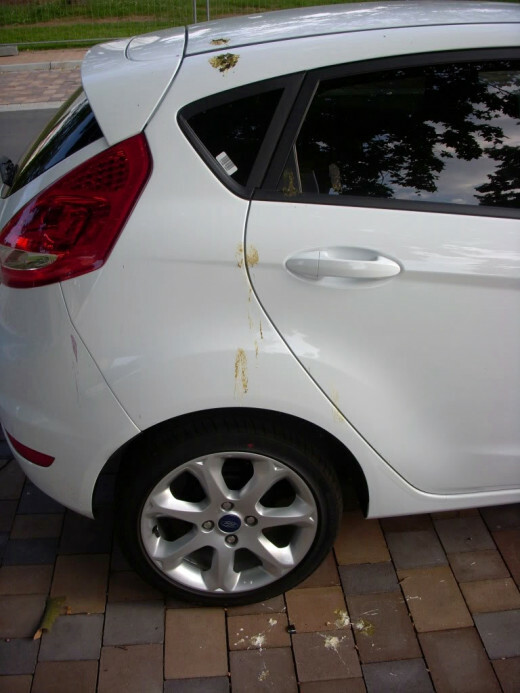 Cars can be washed or parked away from roosting birds. An item on a washing line can be washed again. It would be a five-minute job. Local residents' irrational fears of birds manifested themselves into a frenzy, as in Alfred Hitchcock's horror film. The Birds (pictured). My family had quite happily lived alongside seagulls all my life and we had actively encouraged them to come and feed in our garden. Now, suddenly, they were "the enemy" and we were "mad" to encourage them. 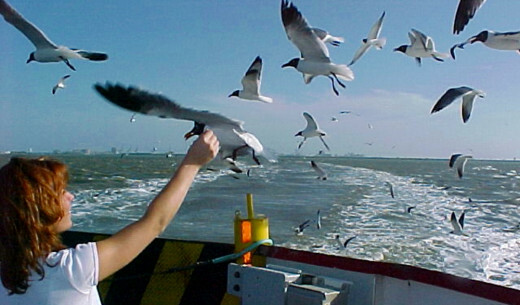 Battle lines were drawn as the community split into animal lovers and those who wished to see the gulls exterminated. One postman less animal-friendly than the first declared he would not deliver mail in this area, as there were too many seagulls. Now, I may be too logical here, but surely a sensible answer would have been to swap his round with a postman, or woman, who was not scared of birds? But no, the local post office agreed he did not have to deliver the mail. Instead, the residents were asked to go to their local sorting office and collect it until the "seagull menace" had abated. 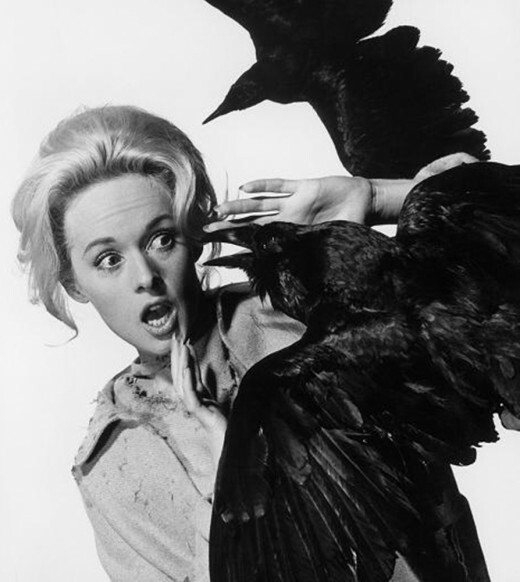 Of course, this further fueled hatred of "the birds" and comparisons were drawn with the Alfred Hitchcock film of that name as the press helped work everyone into a frenzy. Residents rang the local council's environmental health department to see what could be done. The council decided not to go out and poison the seagulls, which came as quite a surprise after their earlier treatment of the pigeons. Instead, they rather sensibly issued guidelines on how to behave when seagulls had young in the nest, pointing out it was for only a few weeks each year and suggesting humans and birds could quite happily live side-by-side. However, this reaction was greeted with outrage. People wanted something to be done. The strength of feeling was brought home to me by my own experience as I drove to work one morning. To my horror, I saw an adult seagull had been knocked down on the busy road. It did not look badly injured and was sitting in the middle of the carriageway, conscious. But cars were merely swerving round it and I thought it was only a matter of time before it was flattened. Its young were sitting on a nearby roof, squawking helplessly, obviously scared. I guessed "mum" had been either foraging for food or teaching them to fly when she had been struck. Quickly, I pulled over, got the dog's blanket out of the back of the car and ran into the road, scooping up the large sea bird and carrying it to the safety of the grass verge. Obviously in shock, it made no attempt to fly away, or even to peck me, but merely viewed me with some suspicion. I stroked its mighty body until suddenly, about five minutes later, it made to peck me and began flapping its wings. I knew my job was done and it was well on the way to recovery. It was uninjured. But as I began to walk away to my car, an elderly gent, who had been watching from a nearby garden, said to me, with some ferocity, "Pity you didn't leave it there to get killed!" I just glared at him, appalled. But sadly, it was not an uncommon view. 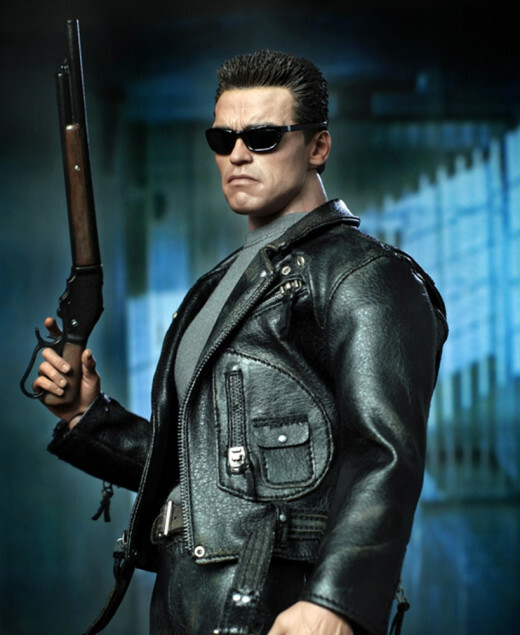 Residents called on a Terminator-type hunter to shoot the birds in return for cash. But the police refused to allow this for safety reasons. Things came to a head after a further newspaper report claimed a gull had stolen a sandwich from a woman in her garden. Judging by the outcry, you'd have thought it had pecked her eye out. "Shoot the seagulls!" demanded the householders. But the council still said no, thankfully, merely reiterating its guidelines on living in harmony. Next, along came someone resembling the title character from "The Terminator," quite happy to pose with his huge shotgun like some kind of deranged mercenary, offering his services, at a price, to any householder troubled by birds. Quite gleefully, he was interviewed in the local press and was proud of the fact he had wiped out whole colonies of birds in other parts of the country. Needless to say, residents clamoured to contact him. But thankfully, before any public shootings could take place, the council and police stepped in to say that even though he had a gun licence, he could not start shooting at birds in the town centre because it would endanger people's lives. So he was sent packing, to the annoyance of those who had demanded his services. For my part I was, of course, glad common sense had prevailed. Strangely, the heated situation all died down in a matter of days after the baby birds had flown the nest and the adults returned to their normal behaviour, totally disinterested in their human neighbours. Of course, it does crop up again every spring, but never, in my view, with the same strength of feeling as when the residents called in a terminator to shoot the gulls dead. Humans and animals can live side-by-side in harmony without problems. The whole situation smacked of total madness. First, humans and birds have lived side-by-side for centuries, so why were the seagulls suddenly such a dire threat to civilization as we know it? 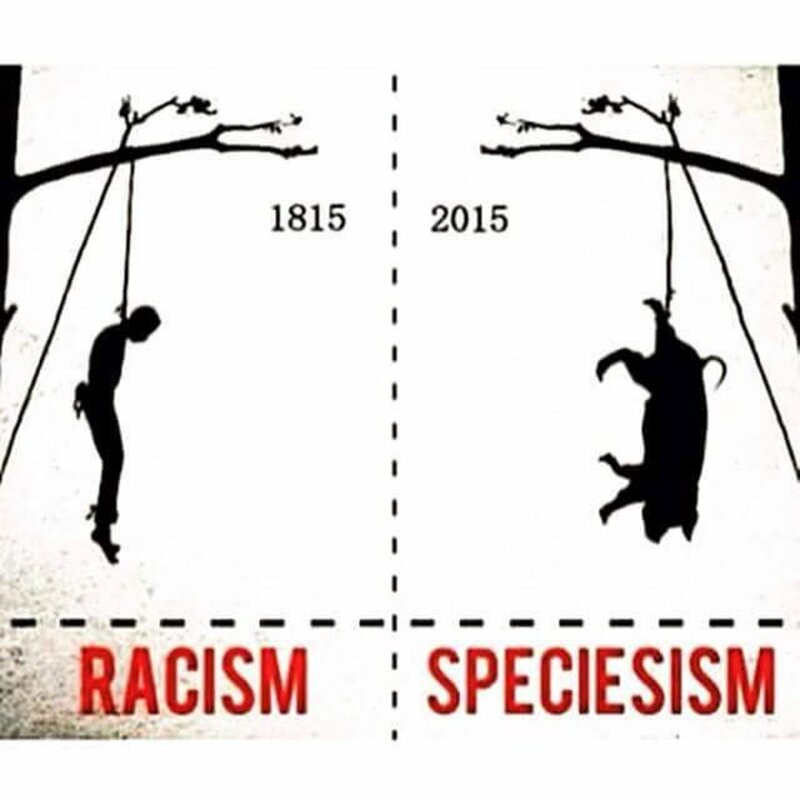 And secondly, what gives humans the right to go out killing other living creatures? What makes us so great that we can play God and take lives at will? Every animal and bird on this planet has just as much right to live as any human (probably more right than those humans who have perpetrated hideous crimes) as they are simply wild creatures going about their day-to-day lives. They are part of nature and as such, we should respect them and not try to kill them just because they may disrupt our lives a little. 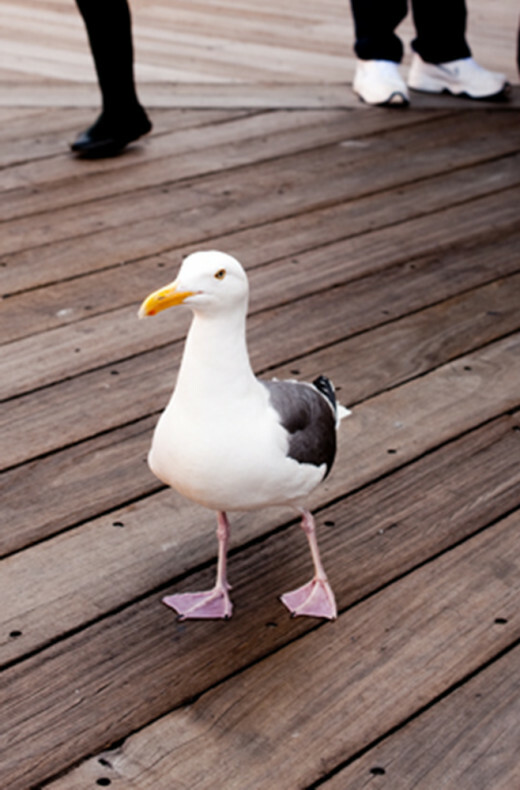 The answer is simple: If you don't like seagulls, don't buy a house on the coast. 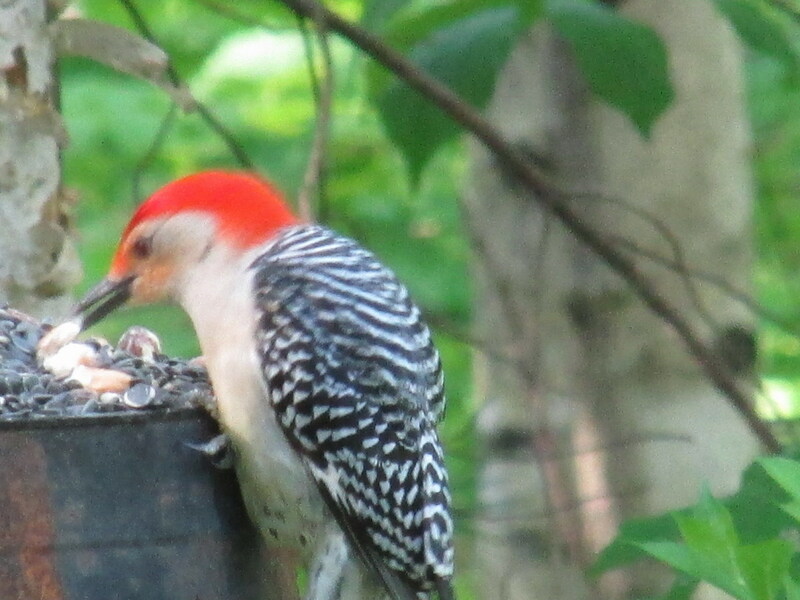 Want to Make Your Wild Birds Happy? Feed Them Nuts! Thank you for the compliment. I just do my bit and do what I can to treat every living creature with kindness. Great article! Thanks for sharing with us. Your compassion for animals is a model for all of us. Thank you so much for your supportive comments. I do agree that as the human population increases, it will get worse for the animals and for the world in general. Sad story, and I think it is going to get all that much worse as the human population increases. In my area it is the urubu (vulture), which has the terrible misfortune of being both black and ugly. A lot of people try to kill them, despite the fact that they keep our beaches clean and clean up any dead animals before they stink and spread disease. Thanks for telling this. The seagulls are lucky to have you on their side.